Thank you for visiting our site. This is a blog post about Wholesale Foil Stamped Business cards. The standard size for a business card is 2.5 x 2 inches. 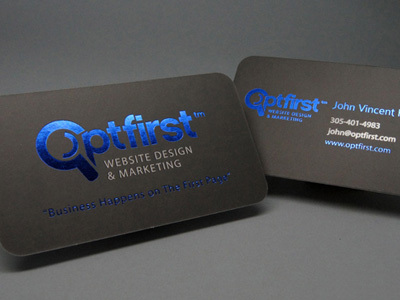 You can have your logo or anything in foil according to your requirement on your Wholesale Foil Stamped Business Cards. You can have it in any shape you would like and in any size you would like. We can laminate it with gloss, which will give it a shiny look. Or with Matte, which will give it a neutral look. We can customize your Wholesale Inline Foil Business Card product according to your desired quantity and size. So, please feel free to contact us and request a quote through email at http://www.colortradeprint.com/contact_us.html or by phone at 1.800.915.6436. Please be specific about your size, quantity, and color scheme. Thank you again for visiting out website and reading this blog. Color Trade Print’s Customer Care Representatives look forward to assisting you with your printing questions and orders. This entry was posted in Business Cards, Design, Printing. Bookmark the permalink. Promote Like a Champ with Plastic Business cards!